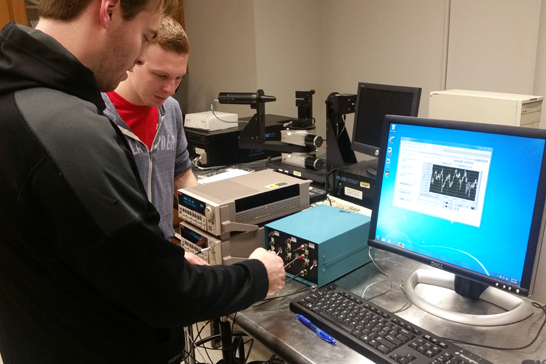 Doctoral student Josh Jones and undergraduate researcher Andrew Klevitch assembling equipment for Inelastic Electron Tunneling Spectroscopy measurements. Welcome. We thank you for your interest in our programs, and we encourage you to learn more by browsing this site, contacting us directly, taking a tour of campus, or attending an upcoming graduate recruitment event. The Department of Physics and Astronomy offers the doctor of philosophy (PhD) and master of science (MS) degrees in physics, with the option of specialization in astronomy. Although we offer a course-only MS, our graduate program is mostly oriented toward current physics research. Students may apply to the master’s or doctoral program, though most of our applicants and students are enrolled in the PhD program and earn their master’s degrees on the way to the PhD. Students who enroll in the master’s program will have to reapply to enter the PhD program. Complete information about our graduate programs, including course descriptions and degree requirements, can be found in the UA Graduate Catalog. Research toward a degree may be conducted in either experimental or theoretical areas. Experimental programs include magnetic materials, high-energy physics, materials science, observational extragalactic astronomy, and particle astrophysics. Theoretical programs include condensed matter, elementary particles, atomic and molecular physics, extragalactic astronomy, astrophysics and particle astrophysics. Learn more about research in the department as it pertains to graduate students on our Graduate Programs page. Visit our Research Overview for more detailed information. Find out how our admissions process works on our Graduate Admissions page. Get answers to your questions about our graduate programs by contacting the graduate director, Dr. Conor Henderson. Visit our Resources for Current Grad Students page for links pertaining to courses, degree requirements, job opportunities after a PhD, and more.